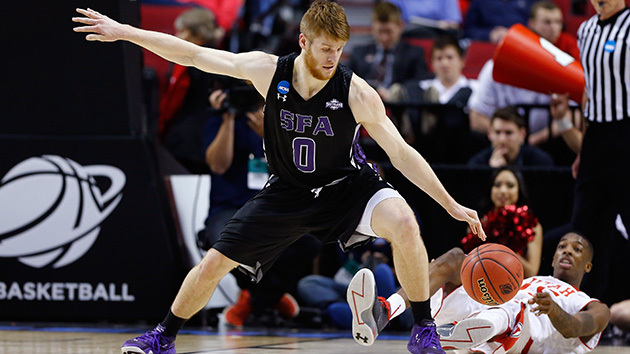 Everything you need to know about the Stephen F. Austin Lumberjacks as they begin the NCAA tournament. As part of its preview of the 2016 NCAA men’s basketball tournament, SI.com is taking a look at all 68 teams in the field. RPI and SOS data from realtimerpi.com. Adjusted offense and defense statistics are from kenpom.com and measure the number of points scored and allowed per 100 possessions, and the team’s national rank. All other advanced stats are also from kenpom.com (unless noted otherwise), and are through March 14. Impact Player: Thomas Walkup, senior, forward. 17.5 ppg, 6.8 rpg. The Case For: Let’s start with the obvious: At 20 games, Stephen F. Austin owns the nation’s longest current winning streak. The last time the Lumberjacks lost, it was 2015. And the results really haven’t been particularly close—SFA has the nation’s top scoring martin, beating teams by an average of 17.6 points. It ranks No. 12 in the country in effective field goal percentage (55.5%) and two-point percentage (55.1%), it has a star in Thomas Walkup and it has a top 30 defense. Here’s the real interesting part: the Lumberjacks’ first-round opponent, third-seeded West Virginia, is well known for its press defense that generates turnovers at a very high rate. But the Mountaineers don’t lead the nation in defensive turnover percentage. Stephen F. Austin does, at 25.9%. The Lumberjacks also utilize a press defense that wreaks havoc on opposing teams, which should make for an extremely fun matchup. As a No. 14 seed, SFA needs any advantage it can get, and having the same strength as West Virginia should help minimize the advantage the Mountaineers would have on a team less familiar with it. The Case Against: A 20-game win streak is impressive no matter where it is, but it can’t be ignored that Stephen F. Austin plays in a pretty weak conference that left its strength of schedule rank at No. 260. It will be a big step up to go from many of its recent opponents to the quality of NCAA tournament teams, and the Lumberjacks didn’t have a great nonconference season. It was four months ago, but SFA opened the season with a 32-point loss at Baylor. It dropped all four of its nonconference games against RPI top-100 teams, leaving it unclear whether the Lumberjacks have improved significantly as the season went or mostly benefited from the schedule getting easier. It’s likely that the answer is a mix of both, but to hang with West Virginia or potential other tournament teams Stephen F. Austin is going to have to have a much better showing than it did against the Bears in November. SI Prediction: Lose to West Virginia in the first round.